From application to life after graduation, this book provides financial insights for those who are college bound. Jodi Okun’s excellent book, Secrets of a Financial Aid Pro, explores what it takes to pay for college. For many high school students and their parents, applying for college is a stressful, often confusing rite of passage. Stagnant wages and ever-increasing tuition have led to a situation in which many families must also apply for financial aid—a process that is its own kind of stressful and confusing. Okun, a former college financial aid counselor who is now an independent consultant, aims to calm and inform the parents of college-bound students by guiding them through the financial aid jungle. The book is divided into three parts. The first part addresses the need to plan far in advance—in middle school or even earlier. The author offers seasoned advice about not just saving money, but preparing students for college. Particularly helpful is the manner in which Okun breaks down the necessary to-dos that should occur in each of a student’s four years of high school. Included are a useful checklist, a list of questions to ask during college visits, and a handy form that students can use to evaluate each school they’re interested in. This section also explains the application process, along with the various admission decisions, such as “early action,” “early decision,” and “rolling admission.” This kind of insider information will be especially helpful for understanding admissions from the school’s perspective. 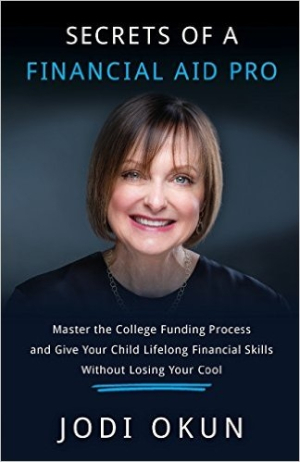 The second portion of the book concentrates on financial aid, clearly and succinctly explaining the different kinds of aid and types of college savings investments. The section also provides a lot of detail, as well as “myth-busters” about FAFSA (the federal financial aid application) that should considerably reduce the apprehension in completing this common form. Okun also runs down everything from grants to scholarships to work-study programs to loans in a chapter that is a treasure trove for anyone seeking financial aid. The third section may be the most unique portion of the book. It covers a subject typically overlooked by college admissions and financial aid sources: money management by students. As Okun points out, “the post-college period will likely still have an impact on your family and, possibly, your finances.” Here, the author offers many good ideas to assist parents in engaging their college students in conversations about money, as well as useful strategies for students to embrace after graduation, such as making a budget, managing expenses, and understanding ways to pay back student loans. The book is well organized, with clear explanations, highlighted text, and short chapters. Each chapter ends with a useful summary of bulleted key points. Jodi Okun has done a masterful job of creating a highly readable, empathetic guidebook with just the right amount of detail. With a calm, experienced voice, she takes the bewilderment out of the college financial aid process for parents and also conveys sensible financial advice to help college graduates take the next step in their lives.